When I first saw this recipe, I was a little skeptical. But I thought that it sounded pretty cool, so I went ahead, and I am so glad that I did. I mentioned before that I am terrified of using the gas grill so I bought myself an indoor grill. This recipe came with the instruction booklet for the grill. I did it on the contact grill feature, which works exactly like a George Foreman. I'm not sure how this would translate onto a real grill, although I am sure it would be fine. If anyone tries, please let me know how it goes! For as long as I can remember, I have loved feta cheese. I can't remember the first time I had it, but I'm sure there was no "getting used to it". It was love at first bite. The tanginess and sharpness of the cheese is what I love, and the pairing with lemon is so classic. I always use full fat feta. I think the reduced fat is decent and the fat free is completely inedible. I literally couldn't even swallow it when I tried. Green beans and I have not always had the best relationship. Normally, I can take or leave green beans, but I loved them this way. I think it is because they are grilled and maintain some crispness. I love some crunch to my veggies which is why I prefer to roast (and now grill) them. I served this with a bunless spiced turkey burger (don't let the picture fool you, these are SO GOOD) and some perfectly sweet corn from Boston Organics. It was an all around delicious meal! 1. 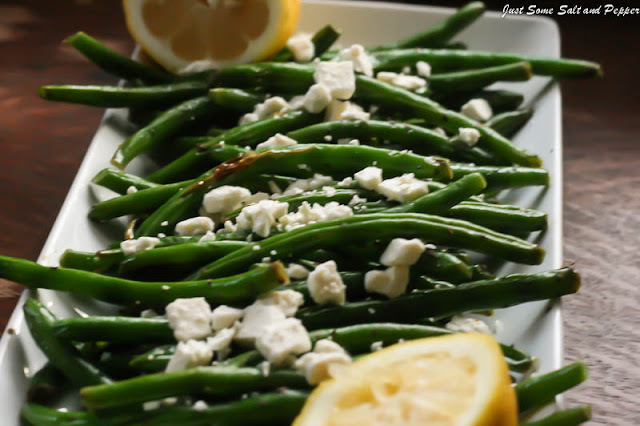 Preheat contact grill to high setting; toss the green beans with the olive oil. 2. When the grill is hot, arrange half of the beans on the bottom plate and grill for 5-6 minutes. Remove to a bowl and sprinkle with half the salt and set aside. Repeat with the remaining beans. 3. Add the lemon juice, basil and pepper to the beans and toss to combine. Sprinkle with feta cheese. 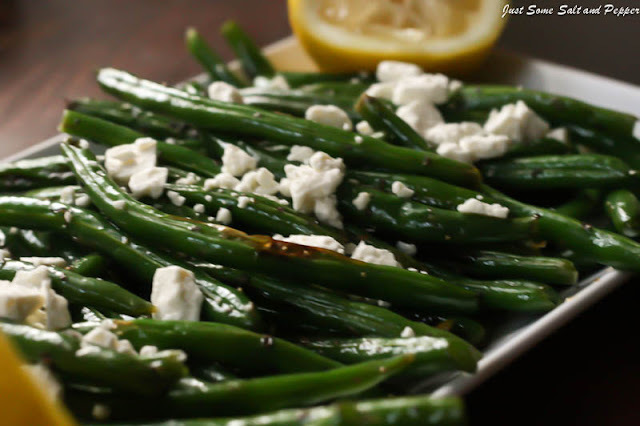 I love feta with green beans - yours look delicious. Green beans are a favorite in my house. These look great! I love that you added feta on top, feta has a nice salty taste that I bet blended really well with the green beans. 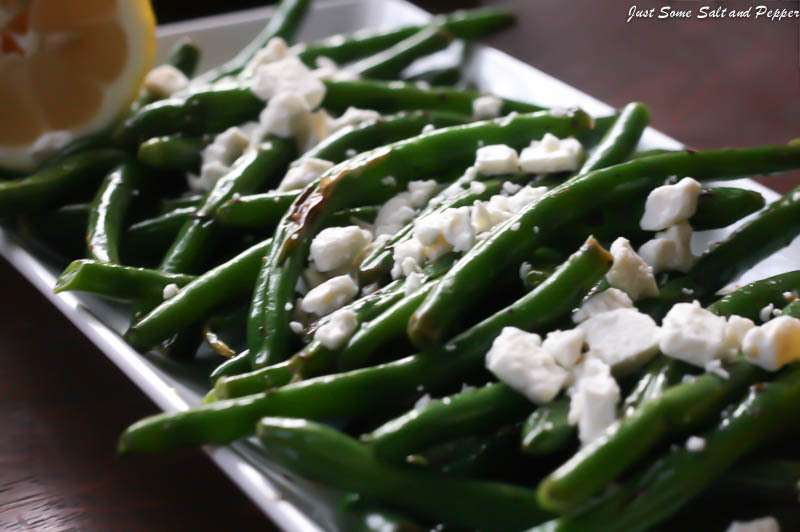 I've never grilled green beans - terrific idea! And feta goes so well with beans, too. Inspired recipe - thanks. Haha. I'm scared of a gas grill too! I thought I was the only one! These green beans look delicious, my friend. Can't wait to try! Simple but delicious! These look amazing! This is such a lovely side dish! I'm a sucker for anything paired with feta. I think these look awesome! I love green beans. I'd eat them every day if that were socially acceptable! This is definitely going to be my next green bean recipe!